The map of Mexico City as it appears in Mario is Missing! Mexico City (Spanish: Ciudad de México; Nahuatl: Āltepētl Mēxihco) is the capital city of Mexico, North America. 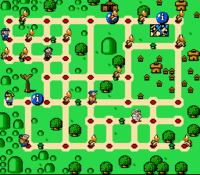 It has made two appearances in Mario-related works. 2 Information from Mario is Missing! It has been requested that one or more images be uploaded and added to this section. Remove this template once the image(s) has/have been uploaded and applied. Specifics: I'm not sure which panorama from the episode will work, but any will do for now. Mexico City first appears in the Saturday Supercade episode Amazing Rollerskate Race. Donkey Kong Jr. and Bones were headed there to supervise some rollerskaters during a rollerskating race and also catch some thieves who were after their skates. Along with Athens, Buenos Aires, Sydney and Paris, it is one of the five cities in Mario is Missing! that Luigi has to visit in order to defeat the second boss of the game, Iggy Koopa. Just like all the other cities in Mario is Missing!, Mexico City was invaded by Koopa Troopas. The enemies stole artifacts from various local landmarks: the Angel of Independence, the National Palace, the Fine Arts Palace, and in the PC version, the Zócalo and the Pyramid of the Sun. Luigi rescues the city by finding the stolen artifacts and returning them to their respective landmarks. "A hat dance will soon be in order when you realize you're south of the United States border." "If you want to get mail here, the envelope must say North America, the Earth and the Milky Way." "Did you really expect to go to Mexico and have no peso?" "You're bound to meet someone you know, it's the most populated city on Earth." "This capital city is the oldest in the New World, founded in 1325!" "Show some respect for the glorious Aztec who settled what is now the largest city in the world." "You're in the Zocalo, amigo, the heart of the old city." "Don't you know...it's the Ciudad de Mexico!" Spanish Ciudad de México Another alternative name is México D.F. ("D.F." is short for Distrito Federal, meaning "Federal District"). The headquarters of the official Nintendo magazine for Latin America, Club Nintendo, are located in Mexico City. This page was last edited on April 12, 2019, at 23:04.